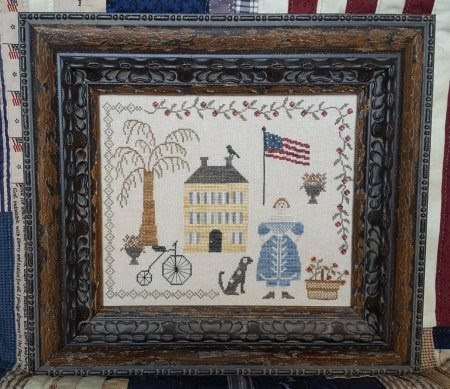 The Finishing Touch: June has arrived! June has begun by bringing soft breezes and beautiful sun for us to enjoy and, likewise, we have many, many new summer season designs to keep our stitching fingers busy. 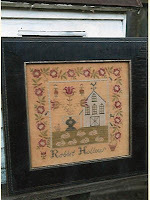 There are two Sale Specials for the month of June. Beginning June 13 until the end of June, we have 20% off any Heart’s Content leaflets or kits in the shop as well as 20% off any pre-cut fabric pieces in our fabric bins. 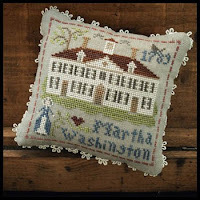 Great time to stock up on fabrics of all counts and colors. 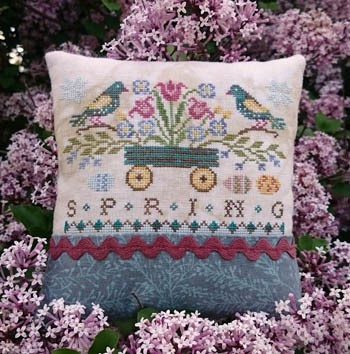 New spring and summer projects are arriving daily and many more to come shortly. Here are a few in the shop now: Lila’s Studio has a new series called Seasons. So far, we have received: Seasons- Spring and Seasons –Summer. 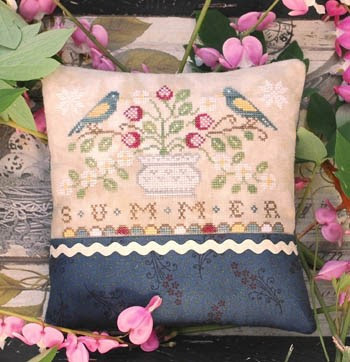 Spring features beautiful birds and spring flowers while Summer features strawberries and birds. Great pair. 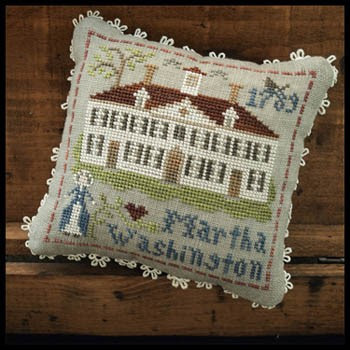 Martha Washington, the third in the Little House Needleworks “Early Americans” series has arrived to join Betsy Ross and John Hancock. This series of 9 designs has a great start and should be lots of fun for summer stitching. Stacy Nash has a new Rabbit Hollow Farm Sampler which reminds me of the bunnies eating the flowers and plants in my own yard – still they are cute! 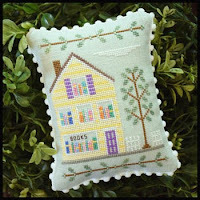 The Main Street Bookstore, second in Country Cottage’s series, has arrived to join the Flower Shop. The spring and summer colors in this little village make it a must have. 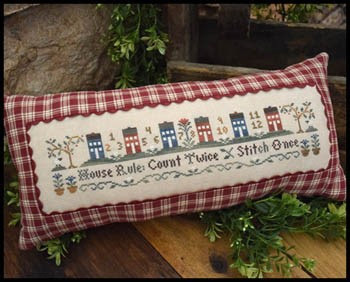 Also from Little House, House Rules, with a row of charming, colorful houses and a count twice rule to live by. Liberty, from Samplers Not Forgotten, is a darling patriotic colonial design for stitching on a lazy summer day. 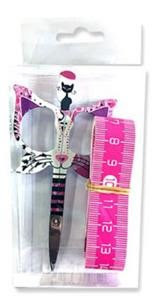 We have new Bohin “cat” scissors which every cat lover needs. All the new things listed above are pictured here. 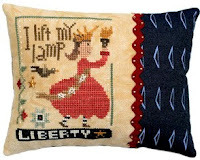 Still to come in the next week are new summer designs from Lizzie Kate and a Wee One “Libby” from Heart in Hand. Watch for photos of these. 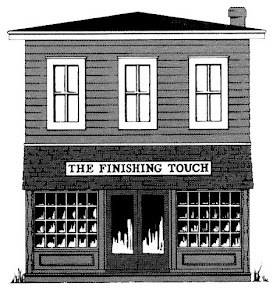 The Finishing Touch will be closed on Tuesday, July 4, 2017. 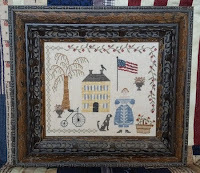 Enjoy the holiday and lots of summer stitching.